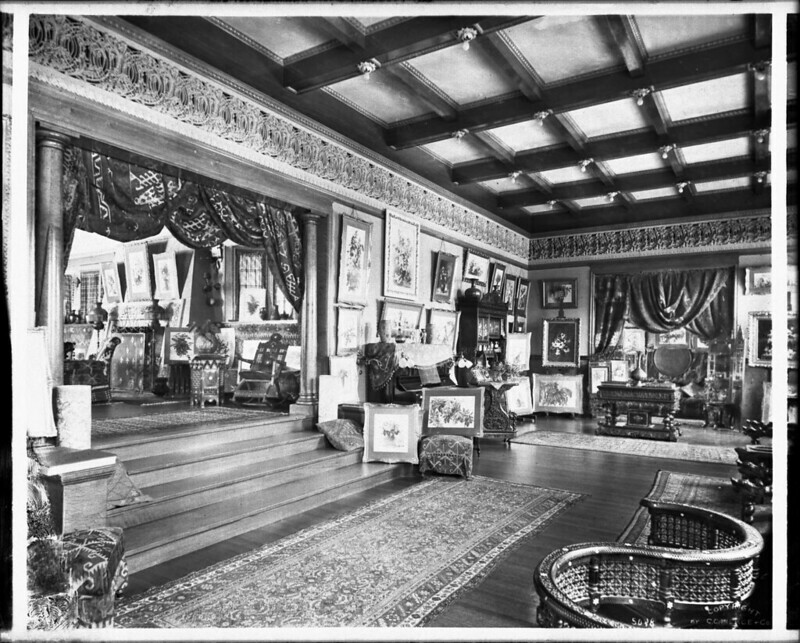 *Photograph of an interior view of the art studio or gallery of the [[ Category Paul de Longpré house and garden|Paul de Longpré residence]] — at [[ Category Hollywood Boulevard, Hollywood|Hollywood Boulevard]] and [[ Category Cahuenga Boulevard|Cahuenga Avenue], Hollywood, ca.1905. :*The decorative inlaid wooden floors are partially covered with fancy rugs of the Moorish-style residence. The furniture includes a love seat, coffee table, chairs, a rocking chair and a piano. The crown molding incorporates detailed circular tracery. DeLongpre’s paintings of floral still lifes are hanging on the walls, leaning against the walls, and sitting on easels, the floor, or the furniture. Numerious lightbulbs are installed in the grid of the panelled ceiling. Three wood stairs step up into an adjacent room at left. : :"A famous French and American flower painter, Paul DeLongpre was the most significant watercolor specialist to arrive in Los Angeles in the late 19th century and became the city’s first major still-life painter. It is likely he was the first southern California painter to earn a major national reputation. In 1899, he moved his family to Southern California because he was so impressed by the floral landscapes and flowers he saw. He paid only ten dollars for a huge lot at Cahuenga and Hollywood Boulevard, now part of downtown Hollywood. He built an extravagant Moorish style mansion surrounded by a three-acre lot on which he grew four-thousand rose bushes. This site became the first tourist attraction in Hollywood, and from the gardens, he found many floral still life subjects." — unknown author. Format (aacr2): 2 photographs : glass photonegative, photoprint, b&w ; 21 x 26 cm., 20 x 25 cm. Image published by Fæ on 2015-02-24 09:52:27 and used under Creative Commons license.